The first “message in a bottle” from the Fill the Sky book blessing was found! The bottle did not have to travel far on its journey, but seems to have landed in just the right hands. 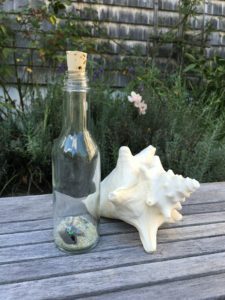 Having safely crossed the currents lorded over by hundreds of seals in Chatham, the bottle made its way from South Beach to North Beach where it was picked up by Linda B. Turns out that Linda and I both spent many of our childhood afternoons on that beautiful spit of sand between the bay and the ocean. She hadn’t been back in years, and said the bottle added to the joy of her day. The note inside was written by my friend Nancy, and expressed her hope that the book will be read with an open heart and an open mind, and bestow some of the magic of Ecuador upon the reader. Amen to that!